Once a no-go zone for online betting operators, Italy is now one of the biggest gambling markets in all of Europe. The country’s punters are blessed with a number of safe options for esports betting online, including some of the world’s best-known bookmakers. Italian gamblers have literally hundreds of online wagering companies to choose from. Only some are worth your time and money, however, and an even smaller percentage offer competitive betting markets for esports. The sites shown above are a great place to start. All are licensed with recognised online gambling regulators and have well-earned reputations when it comes to value odds, market depth, digital security, banking options and customer service. Most importantly, these bookies are trendsetters in the esports gambling world. You will find a wide range of betting options for Counter-Strike, Dota, League of Legends, StarCraft and heaps more, with a special focus on the top e-leagues and major tournaments. If you are ready to start betting on your favourite esports games, follow the ‘Bet Now’ links in the table above. 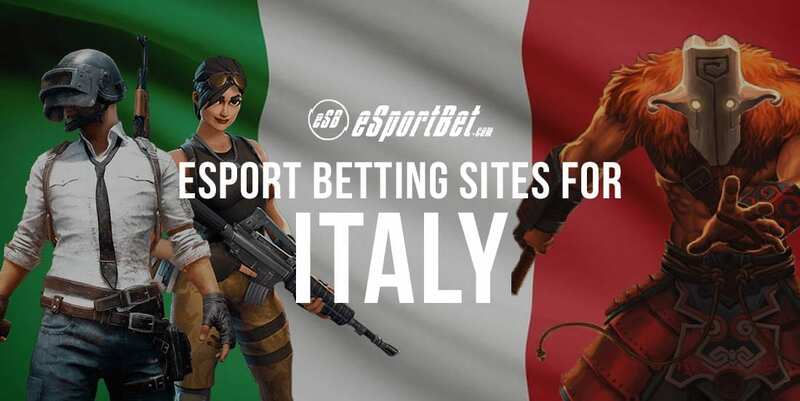 If you want to know more about esports gambling in Italy, read on. Most bookies also accept standard bank transfers and wire payments, but these take several business days to process and are best suited to high rollers who wish to avoid transaction limits. For more information, see our dedicated page for banking options at online bookmakers. Italian football made its first venture into esports when representatives from Roma and Sampdoria contested a game of FIFA prior to a Serie A match in 2017. The FIFA esports scene has grown exponentially in recent years, with prize money for the eWorld Cup rising some 1,438 per cent from $26,000 in 2016 to $400,000 in 2018. The battle royale genre has enjoyed a massive boom worldwide in recent years, and Italy is no exception. PlayerUnknown’s Battlegrounds may have set the trend, but the Fortnite esports scene is far better developed and now draws millions of players on a weekly basis. Italian gamers have played a significant role in the development Pro Evolution Soccer esports. Perhaps the best-known Pro Evo player of all time is Ettore ‘Ettorito97’ Giannuzzi, who has won the PES League individual tournament twice and also took out the team event in 2018. StarCraft was the original esport of choice in South Korea back in the early 2000s, and the sequel now enjoys a strong following all over the world. StarCraft II esports tournaments are serious business these days, with major events such as the SC2 World Championship Global Series Finals offering upwards of $500,000 in prize money. Although World of Warcraft esports events don’t boast the massive prize pools you see in other games, there is decent money to be made at tournaments such as BlizzCon and the continental championships. Just ask Italy’s own Fabio ‘Fabss’ Nardelli, the all-time WoW money leader with over US $145,000 in winnings as of December 2018. Until recently, Italian gamblers were limited to a handful of state-owned betting operators. Besides wagering on sports and horses, which was deemed a pursuit of skill, all other forms of gaming were strictly forbidden. Everything changed in 2006 when the European Commission ruled that Italy’s gambling laws constituted an unlawful restriction of trade. Poker was legalised in 2007, while casino games joined the party a few years later. The biggest changes concerned Italy’s online gambling legislation. Until 2009, residents were blocked from websites that offered gambling services from overseas companies. It was a losing battle for the government, however, and by 2010 it was perfectly legal for Italian gamblers to frequent offshore gambling sites. Italy now has a proper regulatory body for gaming and wagering – Amministrazione Autonoma dei Monopoli di Stado (AAMS) – which offers online gambling licences to operators based in other EU nations. Applicants must meet a strict set of requirements, including a mandatory payment of €350,000 to the AAMS.